This is Kaalicharan. Kaalicharan the dog…perhaps the first dog with the blog. The longueur in blog world badly required a hint of chutzpah and who else to provide it but the greatest of all, your’s truly Kaalicharan! I’ve got so much to write and this damn keyboard…hell,all humans think about is themselves…I guess,I’ll have to order a custom made keyboard to suit my paws.I know, you bloggers are not used to this kind of thing…I can wonder what your medulla and cerebrum would be going through as they’re being subjected to analyse the pawed lexicon of our kind hence I’ll try to express myself in English and with whatever I’ve learned of your weird language, I can very well make out that my vehement dislike for a few specimen of your species wouldn’t be turned down. The cult of Canis familiaris and International United Association of Canines(IUAC) have bestowed their benevolent act through financial funding for this blog…forgot to mention(you see I’m an epitome of humility),the great pains taken by me while working on Harry’s computer! Kaalicharan is here to raise concerns over animal plight. OK you have heard that enough, isn’t it? But look within yourselves and without putting to practice Newtonian logic,you’d come to the realization that you have done nothing yet Do you still frown on the site of a stray dog? Are you a silent spectator when someone stones a lame canine? Would you put a pup out of the middle of the road to safety? Does a part of you goes sallow when you get to know the pains muted species are subjected to…? I hope you are understanding the gravity of the situation. Stand up for dog rights… in fact stand up for all our animal species. I’ve heard enough about man’s superiority in the mother nature’s plan. To quote Peter Parker’s uncle, ”With great power comes greater responsibility”.You fellas think you really are the man…now it’s time that you play one! 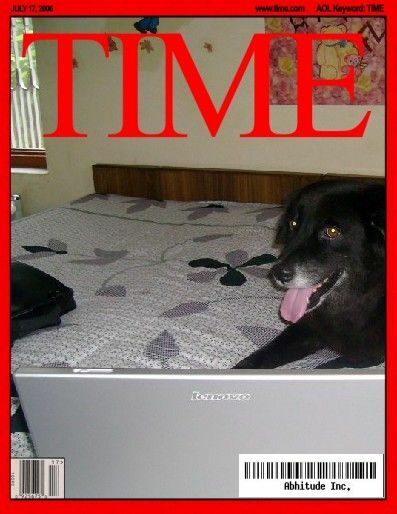 Posted on June 24, 2008 August 24, 2017 Author DogCategories Grrrr.....Tags animal magazine cover, dog breeds, dog diary, dog lover, dog pictures, dog school training, dog who writes, dog with blog, dog's den, guest column, interview dog, love animals, small dog breeds, Time cover dog, top dog7 Comments on Why the dog writes?